A couple of years ago I wrote an HTML rendering library for Emacs so that I could read blogs in Gnus. And because I thought that Emacs should have a built-in method to display HTML. I mean, it was only about 20 years over-due. Simple HTML Renderer (or shr, as the cool kids call it) was included in Emacs 24, and is based on the HTML capabilities of libxml2. So it parses HTML very quickly. The rendering, however, is in Emacs Lisp, so there’s a constant struggle between the impulse to IMPLEMENT IT ALL and not having it be so slow that you wouldn’t want to use it. shr is fast enough to be usable on short, un-complicated pages. But point it to a page containing tables nested ten-deep, and it’s a dog. Mostly because I couldn’t come up with a table rendering algorithm that isn’t exponential. Or something. So this Monday, I came up with the name of the browser while half-asleep: eww! I don’t quite know what the second w is supposed to stand for (Emacs Web Wowser? ), but now that I had a name I just had to start programming. 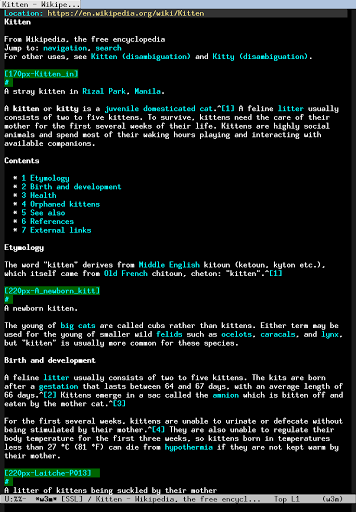 It was only a couple day’s work (mostly implementing support), and here’s how eww renders the Wikipedia page on kittens, which we all consult daily. Probably. Emacs has other, non-built-in browsers. I think the reason they haven’t been included are for copyright assignment reasons. But let’s compare. list is better in emacs-w3m than in shr, for instance. And shr “lifts” the  elements, making the lines uneven. 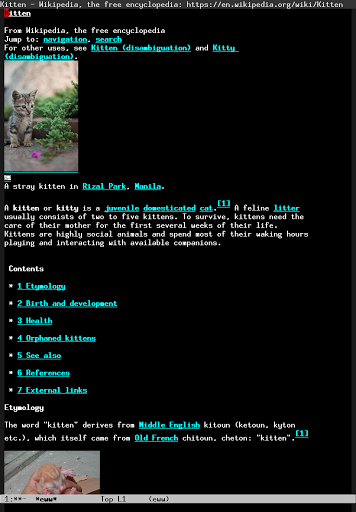 On the other hand, shr displays the images in-line, which surely must be the most important thing on pages with kittens! w3 is more fond of changing font size than both eww and emacs-w3m. My reasoning for disallowing font size changes is that Emacs has a pretty basic rendering model. If you have characters with different widths, lining stuff up is almost impossible. And since so many pages are table-based, it’s more important to make stuff readable than to vary text sizes and use different fonts. But perhaps shr could do font stuff outside of tables? There wouldn’t be much of an issue of lining stuff up outside of table contexts. Anyway, there you go. There’s lots of stuff that could and possibly should be tweaked in eww (and shr), but I think it’s basically usable. Package it and put it on GNU's ELPA. I think it's interesting at least. FYI, emacs-w3m can show images in-line, but it's not “on” by default. For heaven's sake, please go on! Indeed. Press “T” to toggle inline images on/off for the current tab, or press “t” to toggle the image at the point. 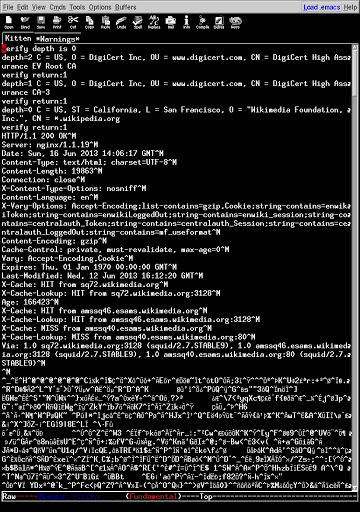 I generally browse with inline images off, and enable images when necessary (eg. diagrams). That prevents most obnoxious advertising. One thing to note is that emacs-w3m always seems to display images at their native size. Does that mean my emacs24 is compiled wrong? Yes. You have to compile your emacs with libxml2 support. You need the latest bzr Emacs to use eww. Hi Lars: I’m using Eww for a lot of my web things, thanks! It’s great and adds a lot of motivation for “living in emacs”. A couple of questions. First, is there a better place other than these comments to ask questions (or file bugs or feature requests)? Second, is there a reason why only one eww process is allowed? Even if I rename the buffer to try and open two eww buffers, both buffers get updated to display the url I requested in the second buffer. Essentially, multiple tabs/pages don’t seem possible. Third, going on on a limb here, but how hard would it be to have eww support the Gopher protocol? Currently, I use lynx, which works great, but it’d be pretty sweet if eww could handle Gopher. However, I’d really want the ability to have multiple eww’s running first (i.e. my second question, above). Finally, not a question, but great work on eww. I look forward to seeing it grow and mature even more than it already has! Nothing new. W3, W3M, Elinks inside Emacs, all of these have been around for years and none of them is usefull. Also, nice to see all buffers hanging while eww loads the page. Hi, Great to find eww but I found that most theme are not good for that on Mac, Space or return are marked by red which made the search result on google is so ugly and in w3m I don’t have this problem, any solutions? Why not give more option for search engine although we could change that , duckduckgo is good but I have to give it up because I could not hardly press next link. And that is it. So, the thing does not work. I wanted to use it so I could apply Emacs regexp search. 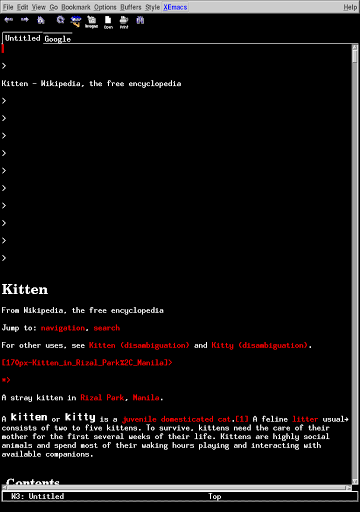 Loaded the page: https://www.gnu.org/software/bash/manual/html_node/Bourne-Shell-Builtins.html , performed the regexp search with ‘^exit’ , found the entry instantly. Great! But then the page disappeared replaced with a message: “Failed connect: No route to host”. All subsequent attempts to load the page failed with the same message. For some reason Firefox won’t search with regexp without installing a plugin. Emacs almost saved the day, but …. failed.